34 >> STUDENT HANDBOOK [italics]Guest hours[/italics] - In every housing unit hours for callers end fifteen minutes before the closing hours for women's residences. [italics]Over-night sign-outs[/italics] - Undergraduate women may sign out on weekend nights only, in accordance with the regular opening and closing hours. Any overnight absence without proper signout is cause for serious judiciary action. [italics]Student Motor Vehicle Registration and Parking Regulations[/italics] _________________________ The car registration and parking program at the University is designed to make use of available parking space in the best interest of the total University and to achieve as equitable allocation as possible of parking privileges to students on the basis of residence in relation to distance from the campus. The parking system imposes an obligation upon faculty, staff, and students to know and observe automobile and parking regulations, and a system of fines is levied for violations, and a system of fines is levied for violations. Automobiles are not a necessity at the University and students are urged not to bring cars to the campus. Those who do have cars will receive instructions regarding regulations when they register. [italics]Car Registration[/italics] - Every student who owns or operates an automobile or two wheeled motor vehicle within the Iowa City area must register the vehicle with the University during registration for classes or within forty-eight hours after bringing the automobile to Iowa City. There is no charge for this registration. At the time of registration, the student is given an identification decal which must be displayed according to instructions given. 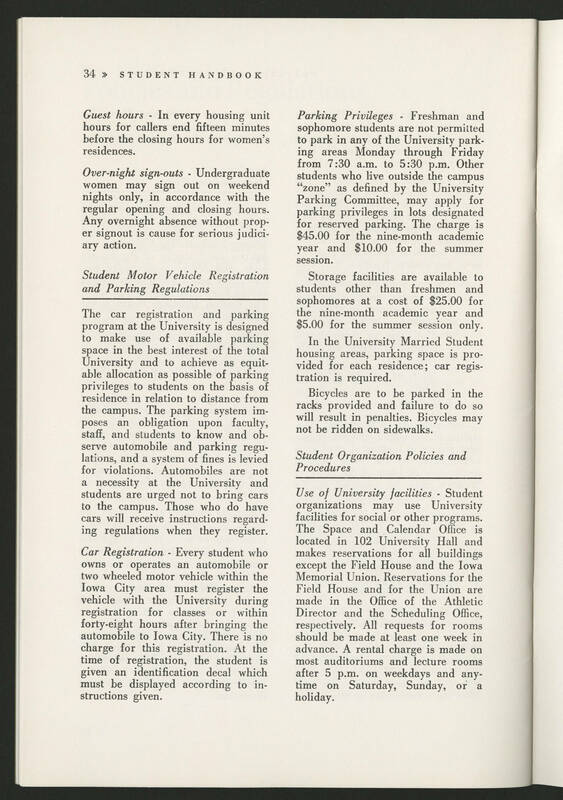 [italics]Parking Privileges[/italics] - Freshman and sophomore students are not permitted to park in any of the University parking areas Monday through Friday from 7:30 am.m to 5:30 p.m. Other students who live outside the campus "zone" as defined by the University Parking Committee, may apply for parking privileges in lots designated for reserved parking. The charge is $45.00 for the nine-month academic year and $10.00 for the summer session. Storage facilities are available to students other than freshmen and sophomores at a cost of $25.00 for the nine-month academic year and $5.00 for the summer session only. In the University Married Student housing areas, parking space is provided for each residence; car registration is required. Bicycles are to be parked in the racks provided and failure to do so will result in penalties. Bicycles may not be ridden on sidewalks. [italics]Student Organization Policies and Procedures[/italics] ______________________ [italics]Use of University facilities[/italics] - Student organizations may use University facilities for social or other programs. The Space and Calendar Office is located in 102 University Hall and makes reservations for all buildings except the Field House and the Iowa Memorial Union. Reservations for the Field House and for the Union are made in the Office of the Athletic Director and the Scheduling Office, respectively. All requests for rooms should be made at least one week in advance. A rental charge is made on most auditoriums and lecture rooms after 5 p.m. on weekdays and anytime on Saturday, Sunday or a holiday.